On June 7, 2018, Ted and Jerry Sorensen went before the Planning and Transportation Commission (PTC) with their proposed 3-story development for 40 Main Street. Their proposal was substantially the same as the 3-story development they have been promoting for the last ten years. It was unanimously turned down by the PTC at that meeting primarily because it offered 0 of the 29 required parking spaces, and exceeded the 30-foot height limit by over 25%, with a proposed height of 38 feet. Exasperated by their continual refusal to significantly reduce the size of their proposed development, the PTC Chair and architect by profession, Phoebe Bressack, who is now serving her second set of terms (1st set was for 10 years, and the second set will be for 8 years) on the PTC, explained that over the years their development plan had come before her some seven times, and the applicants have consistently refused to listen and respond to the concerns of the PTC. At this June 7 meeting, however, at the last minute, given the prospect of having the proposal turned down, their architect, William Maston, asked for the opportunity to return to the PTC with a compliant project instead of having the current design rejected. The PTC granted his request. (This also allowed the project to be refiled without having to pay the re-filing fees). Five months later, on November 8, 2018, two days after the election, the Sorensens submitted their revised development plan. This time, however, it was not for 3-stories, but for 5-stories, and approximately 50 feet high. Below is the rendering they included. The Sorensens had also engaged an attorney from a San Francisco law firm in order to improve their strategic dealings with the City of Los Altos. Part of that strategy is that now the Sorensens are threatening to sue the City unless their application is summarily granted in full, with the claim that since the top floors are for housing, they are permitted to bypass all of the City’s downtown zoning and design requirements. The correspondence of the Sorensens’ attorney relative to this argument minimizes the parking deficiencies, and completely ignores the height limitations. What is particularly offensive, however, is that the attorney crossed the bounds of decency and common courtesy to a highly experienced architect and long-time City volunteer (PTC Commissioners volunteer their time and expertise as a civic duty) by accusing Chair Bressack of lying about having the project come before her seven times. Let’s back up and examine a few background facts. Ted and Jerry Sorensen purchased the property at 40 Main Street in 2007 for $2,840,000, raising that full amount from their own financial resources and those of family, friends, and outside investors. They shared with their investors a project plan that called for a 3-story office building with some 20 parking stalls underground, or, in the alternative, a single story or 2-story office building. For each, they projected substantial profits. They also informed their investors that a City downtown zoning committee had recommended to the City Council that the zoning for the property be increased to a 250% floor area ratio, which would thereby allow three stories. Later in 2007 the Sorensens learned that it would be impossible to place 20 parking stalls underground for technical reasons, but they concealed this fact from their investors for the next five years while taking substantial management fees. In addition, the 250% floor area ratio recommendation turned out to be not true. Eventually, 60% of the outside investors (who had invested over $1.1 million) sued the Sorensens for fraud. The matter was heard before a retired Superior Court judge as part of a judicially-ordered arbitration. There was an eleven-day hearing during which the Sorensens spent considerable time justifying their position and explaining why they had been wronged by the City and the City Council. The result of the hearing was that the judge rejected the Sorensens’ arguments and ruled in favor of the investors. He ruled that the Sorensens were guilty of negligent misrepresentations, a form of fraud, and that the investment had been mismanaged. He further ruled that there was “no evidence presented to establish any impropriety” by the City Council or any public official. In short, the judge found that the failure to obtain approval for the proposed 3-story office building was caused by the failure to propose a building that met City zoning standards or obtain acceptable provisions for waivers of certain zoning requirements. There were two primary reasons that the City rejected the application: City height limitations and the inability to satisfy City parking requirements since parking requirements would obviously have been violated by a 3-story building. In addition, the judge felt that the continued refusal to propose a smaller building, which could easily have been approved within a short period of time after the purchase of the property, showed a willful lack of cooperation with City zoning and parking standards. The Sorensens then sued both the judge and former Councilman Ron Packard (Packard was on the City Council when the application was turned down) with a variety of claims, all of which were summarily dismissed with anti-SLAPP motions (SLAPP is a legal abbreviation for Strategic Lawsuit Against Public Participation and refers to lawsuits filed for strategic purposes and that are deemed frivolous). During the term of the most recent City Council that ended with the election in November 2018, then Council member Jean Mordo was a firm supporter of the Sorensens and their project. During the hearing he testified on their behalf. Some feel that the Sorensens did not file their new 5-story application until after the election because they wished to avoid it becoming an embarrassing campaign issue for Mordo, who was running for re-election. The City now faces the new 5-story approach – complete with the threat of a lawsuit if it is not approved. However, as has been the case for the many years during which this project has been simmering, there is always a twist and an unsuspected surprise. The Sorensens and their attorney have quietly let it be known that they may be willing to compromise and re-propose a 3-story building (i.e., you approve our 3-story building and we won’t sue you). Clearly the threat of the 5-story building and lawsuit were meant to make the originally-desired 3-story building suddenly seem like an appealing option. The City has already rejected the proposed 5-story project. However, true to form, the Sorensens plan on appealing that rejection to the City Council in the near future. As to the accusation by the Sorensen’s attorney that the Chair of the PTC was untruthful in her statement that this project had come before her at least seven times, the Sorensens appear to have somehow neglected to inform their new counsel that prior to a short period when she was off the Commission, Chair Bressak had previously served an 8-year term on the PTC. So in addition to the three times the Sorensen project has come before her in the last couple years in her current term, it repeatedly came before her in her prior term. 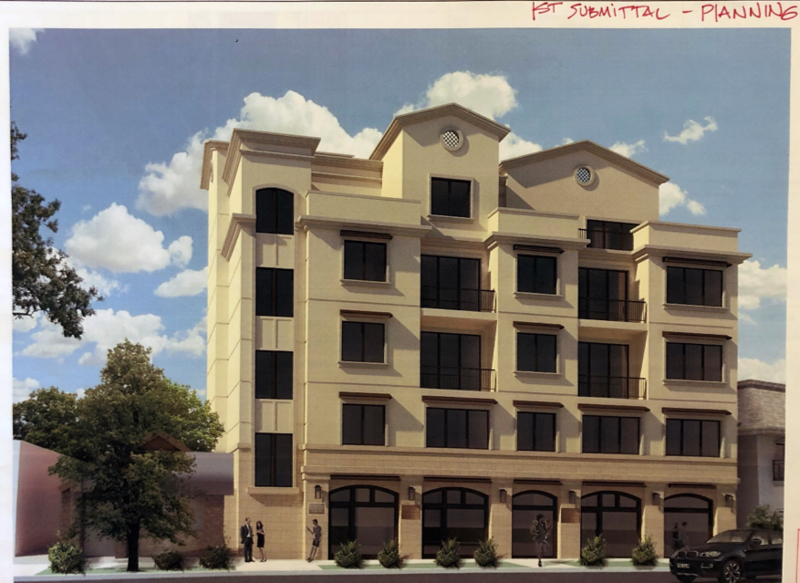 The bottom line to this story is the question of whether or not we as a community want to imitate the 5-story developments in Mountain View along San Antonio Road and El Camino Real. Consider for a moment all the complaints from Los Altos residents regarding the 2 and 3-story developments along First Street. The proposed 5-story development on Main Street would be a colossus by comparison. But, for all those who love that “Manhattan” look and feel, the Sorensens’ project would be the historic and irreversible beginning of the transformation of downtown Los Altos. It’s FOLA’s position that not only should the City’s zoning standards be respected, but, in addition, our village atmosphere which is such a key feature of Los Altos as a community, should be protected at all costs. That small town village atmosphere is one of the many things that makes Los Altos so special. It’s important to us in the here and now, and it’s important that we preserve it for our children. Even if this 5-story application is merely a ruse to get approval for the long-desired 3-story development, this project does not deserve to be approved.